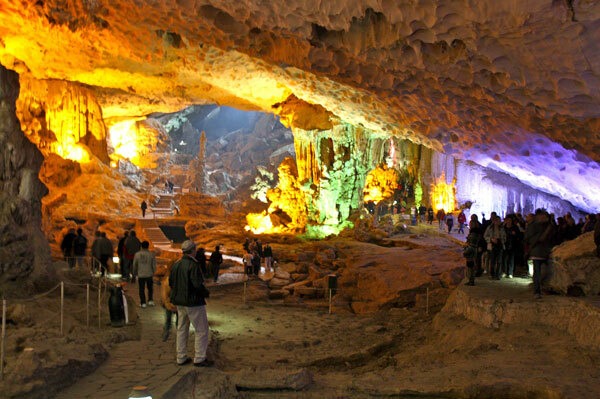 Unless there is something amazing out there that I have yet to hear about, Southeast Asia has exactly two attractions that should be considered for all of those Seven Wonders Of lists. The manmade one is the temples of Angkor Wat, near Siem Reap in Cambodia, which I’ve yet to visit as of this writing, and the natural one is Ha Long Bay (local spelling, sort of) near Hanoi in Vietnam. 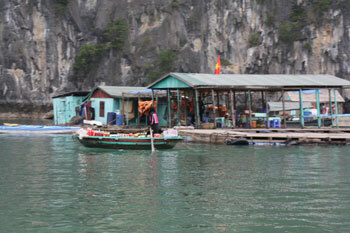 I’ve now been to Halong Bay and I’m pleased to report that it lives up to they hype. In case you haven’t even heard of Halong Bay, it’s a bay that’s about 100km from Hanoi that is filled with almost 2,000 small islands, most of which are limestone. As you can see in the photos on this page, they are mostly tall and sticking out of the water in a pattern not seen many other places on earth. Also, the weather in the area seems to make the bay either misty or foggy nearly every day of the year, so most photos you’ll see have a slightly magical feeling, similar to the way that most photos of Machu Picchu in Peru show clouds below the city on the mountain’s peak. My final week in Hanoi (waiting for the post-Tet craziness in long distance travel to settle down) was actually quite cool so I timed my overnight trip for the warmest day of the week, which happened to be the day before my train to Hue would leave. 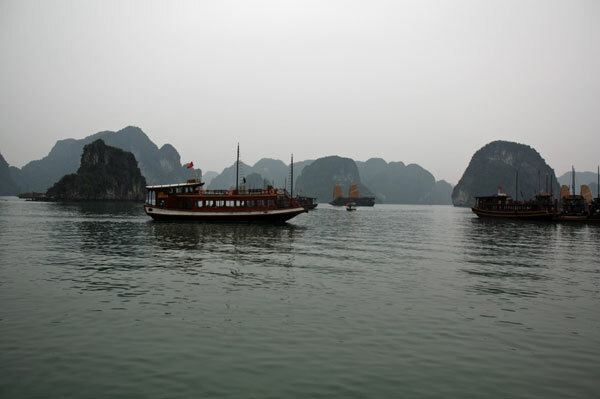 It’s possible to see Halong Bay as a day trip from Hanoi, but that means climbing on a bus around 8am and getting back to Hanoi around 12 hours later, with 8 of the hours in between sitting on the bus itself. 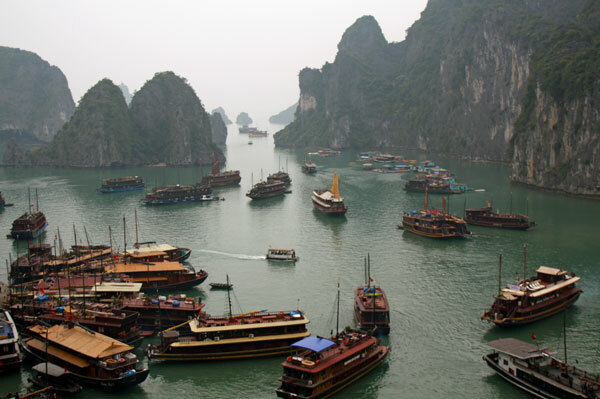 That wouldn’t be too fun, and the overnight cruises are as ridiculously cheap as the hotels in Hanoi anyway, so of course I chose to spend the night on the bay. 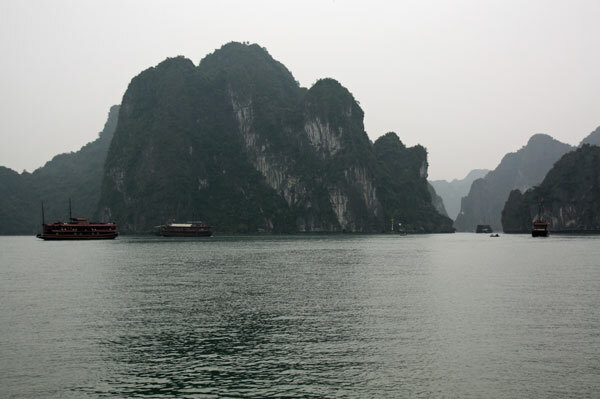 In case you are curious about the details of how the cruises work and whatnot, I’ve written a very long article (with photos) on my new travel site called Halong Bay Cruise: prices, photos, and a review. That article is really meant to help people who are in the process of choosing a cruise themselves, so I’ll put a more basic version here along with my best photos. After doing quite a bit of research I decided to opt for a 3-star cruise, and I paid $68 for a trip that supposedly would be less crowded, fancier, and have better food than the 1-star trip that I could have booked for around $45. Both those prices include the infamous “single supplement” of $15. Had I wanted to take a risk of sharing a room with a stranger I could have saved the $15, but this was my first ever cruise and I didn’t want it ruined by some chain-smoking snorer. The boat is big enough that it can’t pull right up to the dock, so we first load into a small tender, which then takes us out to our main boat and then is tied alongside the main boat for the rest of the trip. Once on board the main ship we are assigned our cabins and then served lunch before the ship even started its engine. Now, I had been eating really good meals in Hanoi restaurants for a couple weeks by then, with main dishes averaging around $2 to $3 each, and the lunch that was served on board was freshly cooked and probably would have been worth $10 to $15 by comparison. It was an almost never-ending series of shared dishes that the six of us at my table would divvy up on our own plates. There were pork and chicken dishes, plus octopus and a whole sautéed fish, in addition to quite a few rice, noodle, and veggie courses. The boat got underway and about an hour later we arrived in the most famous and densely packed part of the bay, and the scenery was stunning in every direction. I’d been taking photos starting once we were moving, but most of those shots are pretty weak compared to the main event that we’d now reached. 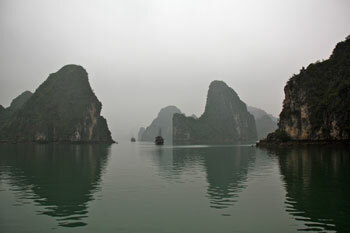 In addition to the bus from Hanoi, the cruise itself and all the meals, these trips include several afternoon activities. There’s a trip through something called Surprise Cave, followed by optional kayaking and swimming. It was too cold for swimming that day, but a few people on my trip did the kayaking while the rest of us hung around on a pier in one of the floating villages. 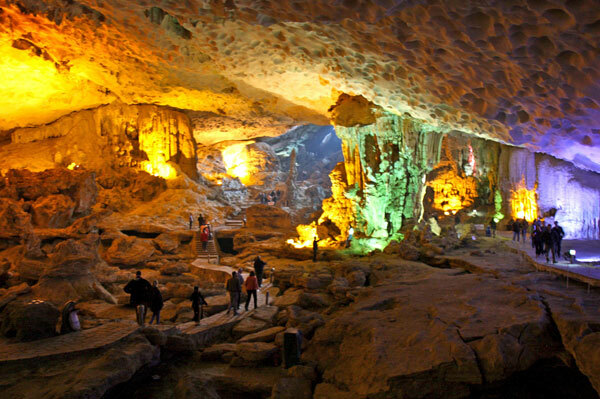 But the highlight was Surprise Cave, which would probably be constantly packed if it were in the US and even cost like $15 to get in. You walk up about 140 steps before you enter and then it’s down and up stairs while you follow one approved path through three main “rooms” in the cave. The place is lit with different colored filters and it’s amazingly well done. There are a few other caves in this bay, but evidently this is the best one so I was lucky that it was on our agenda. Back on board after the various activities, we had dinner that was basically a repeat of lunch except with more of an emphasis on deep-fried things. Again the food was delicious and abundant. It was a nice treat after a couple weeks in Hanoi and Sapa, since portions in this part of the world are more sensible and less American. After dinner we got to do karaoke by the ship’s bar. Of the 11 passengers, 6 of them (including me) were foreigners and the other 5 were actually Vietnamese people. None of us foreigners wanted to sing but several of us were interested in listening. The whole thing turned out to be far more tame than you might expect. I recorded the video below of Lucky, our guide, singing a local English-language hit (I first heard this song in the taxi on my way from Hanoi Airport when I first landed, and it seems to be originally sung by someone from this area, in English). All the other songs that the local people performed were in Vietnamese, so it was just about as odd and exotic as you’d expect. Apparently karaoke continues to be wildly popular in Asia, including Vietnam, and having a good voice is not a requirement to join in and feel comfortable. After a pretty good night’s sleep on the most comfortable bed I’d slept on in the country so far, we had breakfast at 7:30am, and it was only toast and mini omeletes, but still pretty good and plentiful enough. We were asked to pack and check out of our cabins by 9am so they could clean and prepare them for the next day’s guests. I guess this is typical of cruises in general, where they don’t want to waste a day in the harbor if they don’t have to, so they keep the schedule tight and only stop in the harbor long enough to move one group off and another on board. I was hoping that we might have some interesting morning lighting to contrast with the hazy mist the day before, but it was pretty much identical all morning. Still, the scenery we witnessed during the 90 minutes or so of cruising on a different loop back to the harbor was stunning nonetheless. Especially for the money, it’s an amazing bargain. 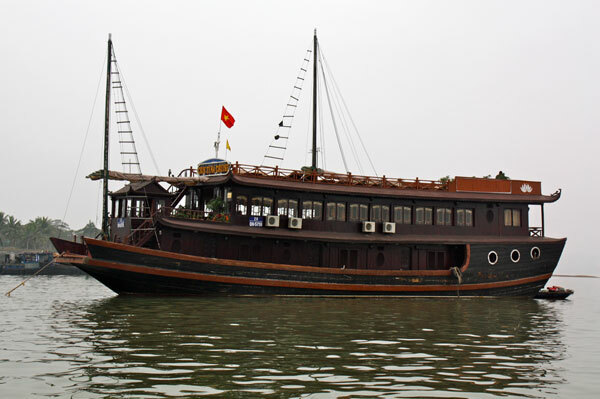 These cruises are probably the single most popular thing for visitors to Hanoi, and I felt it all lived up to the hype. Seeing all those islands coming out of the mist was really breathtaking, and something I doubt I’ll ever forget, especially since I took nearly 200 photos. Was it cold inside the cave? Everyone seemed to be wearing coats and long pants? Bill, yes, it was a cool day in general, probably about 60F or maybe a bit warmer, and a similar temp in the cave. Hanoi itself was even colder the whole week before, which was kind of nice. OK. Love it!!! But…how about some pics of the strange and wonderful food you must be eating. Craig, I’m on it. I’m planning on doing at least one special post all about the food here, and I’ll try to get to it later this week from Hoi An. I’m a bit surprised that the food here isn’t all that strange unless you seek out some novelty item. But the food is definitely wonderful. So far Vietnam feels almost like France in that it’s nearly impossible to find food that isn’t great, except for a couple “pizzas” I’ve had, I guess. WHat’s the WI FI situation outside of Hanoi? Also, and English newspapers for sale? Wi-Fi has been very easy to find in Sapa, Hue, and Hoi An, and from what I hear that will be true in Nha Trang, Da Lat, and Saigon as well. My $10/night hotel here in Hoi An has a good signal in my room. There’s one English-language daily newspaper in Vietnam, and I haven’t seen USA Today or Herald Tribune, though I imagine that at expensive hotels it might be available. With internet so easy to find, plus traveling with my iPhone and laptop, I really don’t need a printed newspaper. Happy holidays and wishing you a great New Years! I enjoyed reading your personal travel notes/journal on both your round the world in 2005 and Vietnam. I really like the embedded videos, it really gives a flavor of where you are at.